The whimsical Lickety-split by Alejandro Cerrudo. Photos by Haylm Heron. Forty years ago Lou Conte founded Hubbard Street Dance Chicago a grass roots company named for its then address. They later moved but retained the title. Significantly, the company was not named for its founder. He was present last night for a performance of his jazzy, Big Band era piece The 40s. While he trained and choreographed it evolved as a repertory company. Typically, for this appearance, there was a long and diverse program. With intermission, four works were presented over two and a half hours. It demonstrated the range, versatility of style and state of the art perfection of one of America’s foremost companies. 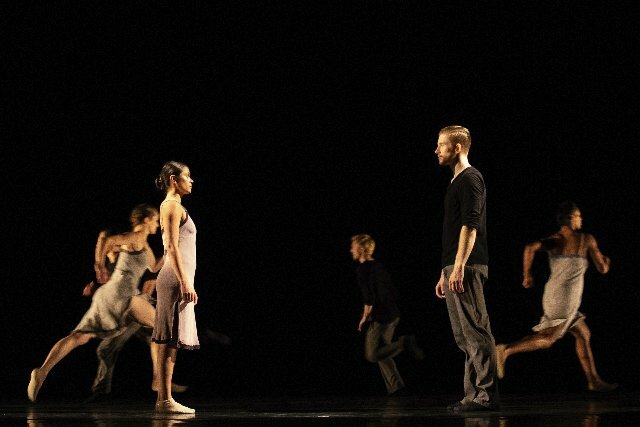 The company has visited Jacob’s Pillow more than a dozen times including as recently as two years ago. Working with so many choreographers it remains fresh and inventive. The first half of the program presented a collage, a work in ten sections, excerpted from dances by the Israeli choreographer Ohad Nahrin. Earlier this season, we were introduced to his junior company, Batsheva, in what proved to a single provocative performance of a long, complex, at times haranguing, insulting and hectoring piece. There were hints of similar mind control manipulation last night. He is renowned for developing and teaching Gaga a technique of self exploration through movement. Even non dancers participate in workshops as was the case during the company’s Pillow residency. In performances we view this as outrageously stunning outbursts. 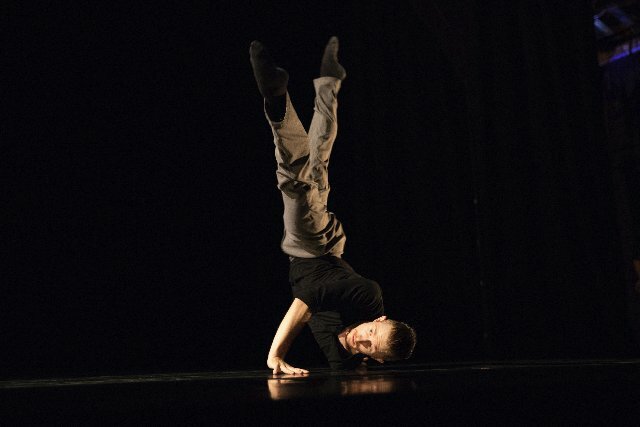 To prepare to perform his work Hubbard dancers spent six months to learn Gaga techniques. It is a tribute to their dedication and ability that they were able to present this complex, demanding, mult-valent piece with polish and panache. Working with numerous companies Nahrin tailors and refines the collage hence Decadence/ Chicago dated 2018 which represents this latest commissioned iteration. We are presented with a sampler of his work in distinct segments and modes. Some were inventive, fresh and energizing while other passages were oppressive and annoying. The opening segment, for example, was galvanic. The dancers in colorful attire formed a dense cluster. It was initially all upper body movement with extended arms and splayed fingers. There were Gagaish spactic, staccato shakes. At one point they began to smile, grin then break out into hilarious laughter. Facial expressions are a part of his approach. The dancers eventually stood, spread out and let the movement change and undulate. It was a great beginning and we longed for more. As was the case in the earlier appearance by the company there were oppressive mind control narrations and repetitive mantras. At one point a rabbi-like character with a droning, Big Brother, voice (evoking a Sacha Baron Cohen character and riff) demanded that the audience stand. For many seniors this was difficult and uncomfortable. Stating various criteria, segments of the audience were allowed to sit. Those celebrating their birthday were asked to remain standing. It came down to two individuals. “The woman with a fan” was escorted to the stage. She was shown to a chair between two rabbinical men. Gamely, she emulated their movements and even hammed it up to the delight of the audience. As an insert this highlighted the trite fixations and tendencies of Naharin’s hit and miss creativity. The most powerful piece of the program was Grace Engine by Crystal Pine. It was menacing, stark, and grimly futuristic. The ominous score by Owen Belton evoked an abstracted, clanging engine rather like a locomotive. Initially, a single male figure in a loose black suit appeared to be buffeted by a powerful, force field. At the back of the stage, behind a row of floor level blinding lights (by Jim French), we observed a passing line of similarly attired dancers. These divide equally into groups of male and female combatants. There are striking formations and silhouettes. The tension is palpable and morphs into death struggles as rough romance. It’s an grim glimpse of the break down of our democracy to an every man for himself combat for survival. 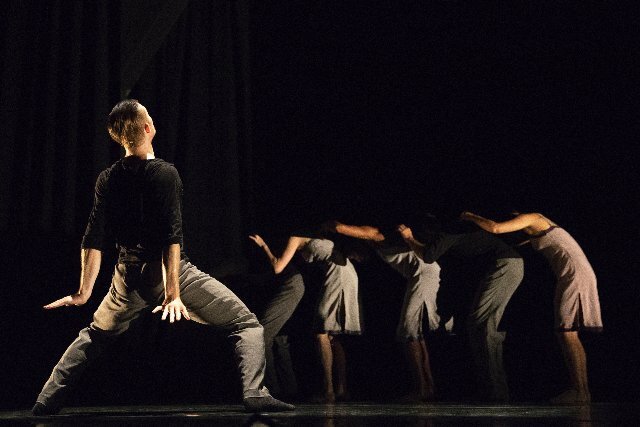 This was an exciting piece by a former Jacob’s Pillow award- winning, emerging choreographer. While, as a repertory company, Hubbard Street avoids a dominant signature Alejandro Cerrudo has been a long term artist-in-residence. His piece Lickety-split, for three couples, provided wit and whimsy. After the intensity of the preceding works it was time to cool down from a heavy duty emotional program, sit back, and have fun. This was a playful piece with the women in loose, laced slips and bare feet. The men wore black pants, socks and t-shirts. The dancers appeared to be having a good time with the mating game which proved to be infectious for the audience. Ending the program with The 40s sent us home with a smile on our face. Rather than performing to vintage big band music they were accompanied by a long and inventive arrangement of the classic “Opus One” by Sy Oliver. It was composed by Tommy Dorsey in 1943 for the film “Broadway Rhythm.” No doubt many in the audience swayed to its familiar refrain in a stroll down memory lane. In costumes by Julie Nagel the dancers wore tuxedo pants, formal shirts and black tie with soft white shoes. Conte’s choreography neatly evoked the lindy moves of the golden age of swing. We much anticipate the next appearance of the superb Hubbard Street in the Berkshires.